"This is a superb entree that won't break the bank and is so easy to prepare. Your guests will love it. I usually use monkfish, which has a lobster-like flavor but you can use any white meaty fish, even tilapia. It takes about 30 minutes from start to finish. Serve with your favorite white wine, rice pilaf, and roasted asparagus." Combine shrimp soup and cream cheese in a small saucepan over medium heat; cook, stirring constantly, until the cream cheese has melted and sauce starts to bubble, 3 to 5 minutes. Stir in sherry. Cook, stirring constantly, until heated through, 1 to 2 minutes. Remove from heat and keep warm. Season monkfish fillets with salt and black pepper. Place in a shallow baking dish. 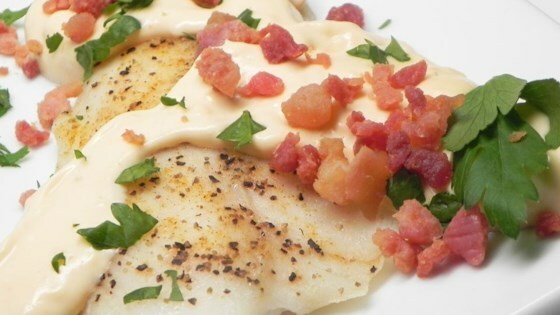 Bake monkfish in the preheated oven until flesh flakes easily with a fork, 10 to 12 minutes. Transfer monkfish to serving plates. Serve topped with sauce and garnished with parsley. Chef John's super simple method to prep and enjoy lobster! If you have a convection oven, bake at 375 degrees F (190 degrees C). I made this exactly as written. I found the sauce too strong and it hid the fish flavor. My husband enjoyed it.